Like most international squash finals, the final of the inaugural PSA Black Ball Women's Squash Open will feature two Egyptians competing for the $107,000 prize money. The pair are the top two players in the world: world number one Raneem El Welily and world number two Nour El Sherbini, who will compete for the first title of this gold category event, which saw the participation of 24 of the world's best players. En route to the final match, El Welily survived an epic semi-final against her teammate Nouran Gohar, the world number eight, which lasted 66 minutes and ended in her 3-2 victory (9-11, 11-7, 11-5, 4-11, 15-13). El Sherbini had a much easier time; she needed only 34 minutes to beat world number three Joelle King of New Zealand in three sets (11-7, 11-4, 12-10) to earn her place in the final match of the five-day event. 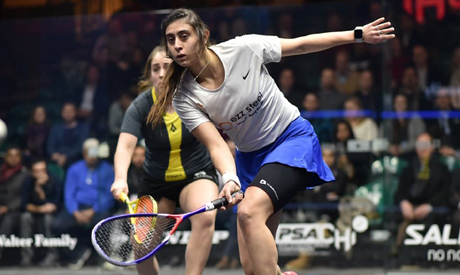 The final, which is scheduled to be held at 6:30 pm local time in the glass court of the Black Ball Squash Club in New Cairo, is being dubbed a “clash of the titans” to be held in front of an enthusiastic home crowd. "It was the huge and long experiences of both players in the courts that have taken them to the highest levels and the finals of almost every competition they played,” said the tournament's technical director Ashraf Hanafi. “Being in tonight's final is a proof. We are looking forward to an exciting and thrilling final which we are sure the spectators will enjoy it," Hanafi told Ahram Online. Tournament director Mohamed Raef also confirmed the superiority of the two finalists in the squash world, saying: "Having the top two players in the world El Welily and El Sherbini reaching the final of our competition confirms the dominance of the Egyptian squash women players of the sport, as we have seen an all-Egyptian men's final in the PSA Platinium Black Ball's Men's Squash Championship some months ago."